You are here: Home > Glucosamine & Chon. Bluebonnet�s MSM Powder provides pure patented methylsulfonylmethane (OptiMSM�), a superior, distilled form of active sulphur. Available in easy-to-swallow vegetable capsules for maximum assimilation and absorption. Methylsulfonylmethane (MSM) is an organic compound present in some food and beverages. Preliminary research suggests MSM can support joint health. MSM 1000 mg Tablets is one of Solgar's premium-quality bone and joint support products. 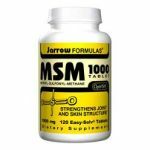 Jarrow��Formulas���MSM?Sulfur��is an organic �source of �bioavailable�sulfur. Sulfur is an antioxidant mineral found in major structural tissues of the body �such as cartilage. The sulfur from �MSM�is used to �produce glycosaminoglycans (or mucopolysaccharides) �present in proteoglycans such as chondroitin sulfate, dermatan sulfate, and hyaluronic acid. * These �sulfur��containing glycosaminoglycans are found in high concentrations in connective tissues, including joint cartilage, skin and collagen. Get answers from an expert. For product information please contact our nutritionists at Sundrops.com. MSM Powder is one of Solgar's premium-quality bone and joint support products. Get answers from an expert. For product information please contact our nutritionists at Sundrops.com. Natrol� MSM Glucosamine is a combination of Glucosamine and Methylsulfonylmethane (MSM), designed to support healthy joints and connective tissue. Glucosamine is a vital building block for joints and cartilage that helps ease joint discomfort. MSM is an organic compound present in some food and beverages that naturally benefits joint health, according to preliminary research. Natrol� MSM Glucosamine is a combination of Glucosamine and Methylsulfonylmethane (MSM), designed to support healthy joints and connective tissue. Glucosamine is a vital building block for joints and cartilage that helps ease joint discomfort. MSM is an organic compound present in some food and beverages that naturally benefits joint health, according to preliminary research. Glucosamine is the ideal supplement for joint and cartilage health. It is present as a natural compound in almost all tissue. Glucosamine promotes joint health and nutritionally works to promote the structural framework of healthy joints. It promotes joint mobility, range of motion, flexibility, and helps ease occasional joint stress due to exercise or physical activity. This important supplement can help to protect, rejuvenate, renew and revitalize healthy joints and cartilage. This product provides vegetarian, shellfish-free Glucosamine Hydrochloride. Bluebonnet�s MSM 1000 mg Vcaps provides pure patented methylsulfonylmethane (OptiMSM�), a superior, distilled form of active sulphur. Available in easy-to-swallow vegetable capsules for maximum assimilation and absorption. Natrol� MSM Glucosamine Creme brings together the powerful benefits of MSM and Glucosamine in a topical formula. A non-greasy formula, Natrol� MSM Glucosamine Creme has soothing and calming effects.� MSM 1000 mg Tablets is one of Solgar's premium-quality bone and joint support products. Bluebonnet�s MSM Powder provides pure patented methylsulfonylmethane (OptiMSM�), a superior, distilled form of active sulphur. Available in easy-to-swallow vegetable capsules for maximum assimilation and absorption. Methylsulfonylmethane (MSM) is an organic compound present in some food and beverages. Preliminary research suggests MSM can support joint health. 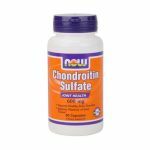 Chondroitin Sulfate is glycosaminoglycan and is a normal component of many body tissues, including articular cartilage. * Our Chondroitin is high potency and is derived from bovine cartilage. Glucosamine is an essential substrate for the formation of glycoaminoglycans (GAG's) and proteoglycans, which are the main components of cartilage tissue. GAG's and proteoglycans trap and hold water, forming a dense fluid cushion within the joint and thus, provide lubrication and shock absorption. MSM (Methylsulfonylmethane) is a natural source of organic sulfur, a mineral necessary for the production of proteoglycans. * NOW's unique and synergistic formula is suitable for vegetarians, because it contains only Glucosamine from a vegetarian source and not from shellfish. Bluebonnet�s Glucosamine Chondroitin Plus MSM Vcaps provide a potent, synergistic blend of joint-supporting nutrients per serving, such as: pure glucosamine sulfate (1000 mg), chondroitin sulfate (500 mg) and OptiMSM� (500 mg), a superior active form of sulphur plus 500 mg of vitamin C from L-ascorbic acid. Available in easy-to-swallow vegetable capsules for maximum assimilation and absorption. 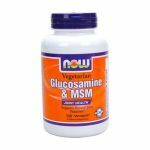 NOW Glucosamine, Chondroitin MSM combines three of the most popular and effective nutrients for supporting joint health in one dietary supplement. Our Glucosamine and Chondroitin are both 100% sulfate, the most studied form of these nutrients. In addition, we also include MSM (Methylsulphonylmethane), an organic form of sulfur found in all living organisms. Studies have shown that these nutrients provide dietary components that support healthy joint structure and function. * Support joint flexibility and comfort with Natrol� Veggie Hyaluronic Acid MSM Glucosamine - a triple-action joint formula. Our potent combination of Hyaluronic Acid, MSM and Glucosamine helps maintain joint flexibility and comfort, while promoting healthy connective tissue. 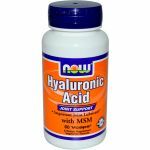 Hyaluronic Acid is a component of synovial fluid found in the joints of the body. MSM is a compound that strengthens collagen. 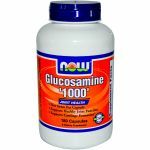 Glucosamine is a compound found naturally in the body that is used in the formation and repair of cartilage and other body tissues. By combining all 3 of these powerful ingredients together, you get the benefit of joint flexibility, strengthening, comfort and repair.